Since the very beginning, the machining titanium process industry has been surrounded by a special ambiance. It developed as quickly as any structural metal in history and with unprecedented involvement of the government as a participant, customer, research and development sponsor. Mysterious, fascinating, exciting, frustrating, unusual, expensive, lavish, vital, critical – such are the terms used to describe titanium development from the curiosity to the maturity. Only in the case of the Manhattan Project for the development of the enriched uranium has there been such a concentration of scientific, technical and financial support for a single metal and this trend is ascending as technology advances. The term "machining" has broad application and refers to all types of metal removal and cutting processes. These include turning, boring, milling, drilling, reaming, tapping, both sawing and gas cutting, broaching, planning, gear hobbling, shaping, shaving, and grinding. The background for the increasing interest in machining titanium is the demand for weight reduction across all the industrial sectors, especially in the construction of modern aircraft, not to mention the space exploration projects that are currently under way. Even with the introduction of new materials, such as carbon fiber, titanium is still gaining ever more in importance. Structural components which are held together by carbon fibers are ever more frequently produced in titanium and they tend to form the base structure of any application. Accordingly, the number of challenges for the components made of titanium which have to face the difficulty of machining titanium is increasing. Titanium has a lot of advantages, but machining is costly. Titanium alloys are mainly characterized by low density which is only a little more than that of aluminum. Simultaneously they show twice as high a strength so that structural components can be designed slimmer and with lower weight. Their bad machinability has a negative impact on manufacturing costs due to low cutting speeds and short tool life. The most important reason for this bad machinability is the extremely low thermal conductivity of titanium alloys. Titanium conducts heat about ten times worse than steel. Contrary to the machining of steel the heat produced during the cutting process is therefore not evacuated with the swarf, but the major part of the heat is concentrated inside the tool or the cutting edge. The solution usually resides in carbide steels which are resistant, tough, wear resistant and also serves as a heat barrier, though this is often amplified by additional coating. 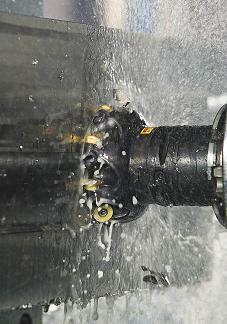 However, as tough as tooling devices may be, machining titanium still bears additional issues. Titanium has a strong alloying tendency or chemical reactivity with material in the cutting tools which cause galling welding, smearing and rapid destruction of the cutting heads. Due to its relatively low modulus titanium has a tendency to move away from the cutting tool unless heavy cuts are maintained or proper back-up is employed. Machining titanium is critical, because, if not approached professionally the surface of titanium alloys is thought to be easily damaged during some traditional machining operations. Damage appears in the form of micro cracks; built-up edge; plastic deformation; heat-affected zones; and tensile residual stresses. In service, this damage can lead to degraded fatigue strength and stress corrosion resistance.